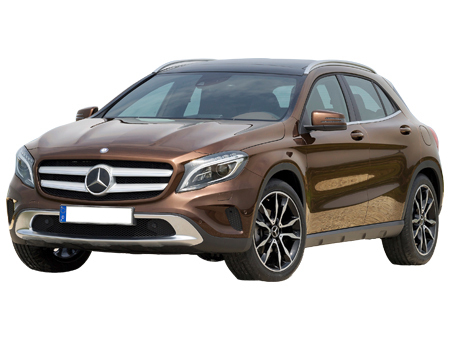 Injected with sportiness and pumped with dynamism the next innovation from the undefeated German auto-giant Mercedes-Benz is the Mercedes-Benz GLA-Class. The auto-innovation comes in the face of a luxury compact crossover that was showcased at the 2013 Frankfurt Auto Show. The concept verison of the car was unmasked in the Shanghai Auto Show in April 2013. The sharp contours and the strenthered bold skin of the car gives it a commanding road presence. The robust front face of the car is complimented by the bi-xenon headlamps and the imposing two-slat chromed grille. The expressive side lines and the well-tweaked rear bumper hints the sportiness instinct of the car. The overall dimensions of the car measures 4417 mm X 2022 mm X 1494 mm (L X W X H) and wheelbase measures 2699 mm that leads to enough cabin space for the occupants. The 18 and 19 inches alloy wheel designs fitted in the car adds towards the precise handling. What to opt for: The sportiness injected is complimented by a decent dynamism, which makes the insurance of the exterior parts (windshield, bumper, headlights) necessary.The expensive accessories should also be covered and a total parts cover remains an optimal choice. Luxury comes to life with the perfectly crafted interiors of the car. The cockpit offers a delicious feast of authority with the 14.7 cm multimedia display compatible with navigation and the leather-attired power steering. The purely supportive leather-wrapped seats and the Audio 20 CD sound system weave the comfort part of the cabin. The interior ambience can be accentuated with the panoramic sunroof feature. A 421 litres of space is dedicated towards the cargo volume. What to opt for: The cabin is fed with advanced technologies and dependable safety features (ESP, HSA, immobilizer, etc.) and the driver cover should be opted. The anti-theft system installed mitigated the need of theft insurance. The car with its precisely-engineered performance and the luxurious features is crafted to give tough competition to the BMW X1 and Audi Q3. Considering the price and high parts price, the car must be considered under the full damage insurance cover.